Recipe for sweet sopressata: As you probably know "sweet" means "not hot". 1. Trim the surface fat down to the menbrane from the pork butts and reserve. Remove the bone. 2. Remove the layer of connective tissue (membrane) down to the meat and discard. 4. Mix in all the ingredients by hand (or machine). Refrigerate overnight. This allows the salt and nitrite to equally distribute as well as chill the meat for better stuffing. 5. Stuff into beef middle casings into about 32 inch lenghts. Portion by tying off about 8 inch pisces with cotton twine. Leave a loop at one end to hang. It's helpful to tie with a piece of string in the middle of each piece to maintain shape for drying. Use a stuffer that can be packed tightly to prevent any air voids in the sausages. 6. Ferment for 48 hrs at 80 degrees. DO NOT FERMENT WITHOUT STARTER CULTURE. a. I recommend spraying a mold solution on the sausage before fermentation. 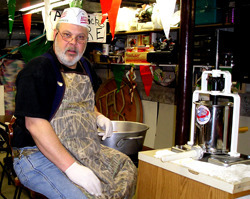 b. I put the sausage on a rack and covered the rack with a sheet of 1 mil plastic. For heat, I used a warming tray with a pan of water on it. You want to see a slight fog on the plastic film. A handheld thermometer poked though the film will help monitor Temp. 78-82 F is fine. c. Following fermentation, it's fine to wash the mold off or a slight film of yeast may appear which need to be washed off. Warm water in a sink is fine. 7. Hang in your basment for 2-3 weeks until about 25% weight loss. Some may prefer 30%, but too dry for me. Looking for about 65-70% humidity. Summer is best for this. 8. When dried to your preference, soak the sausage in warm water for about 20 minutes. Remove the casing now. It's annoying later. Let the sausage dry at room temp for 30 minutes and vacume package and refrigerate. Refirgeration is not necessary, but better. Oil packing works too, but I'm not a fan. 9. Sausage will be better after about a month when the moisture fully equilibrates. 10. I bought my casings, modern cure, Lactobacillus starter culture and Penicillium mold at sausagemakers.com. a. Casings are well packed in salt. Soak them in a sink and fully rinse off all the salt inside and out. b. Modern cure is 93.25% salt, so the total recipe has 3% salt. The rest is sodium nitrite. Don't use more than you need. c. Sugar works just as good and dextrose for Lactobacillus starter culture. The level used should be just enough to get the pH to 4.8-5.0. The salami will not be sour at this pH. This recipe is for 3 pies. Grease and flour pie plates and add bottom layer of dough. won’t get soggy….that is it, good luck. 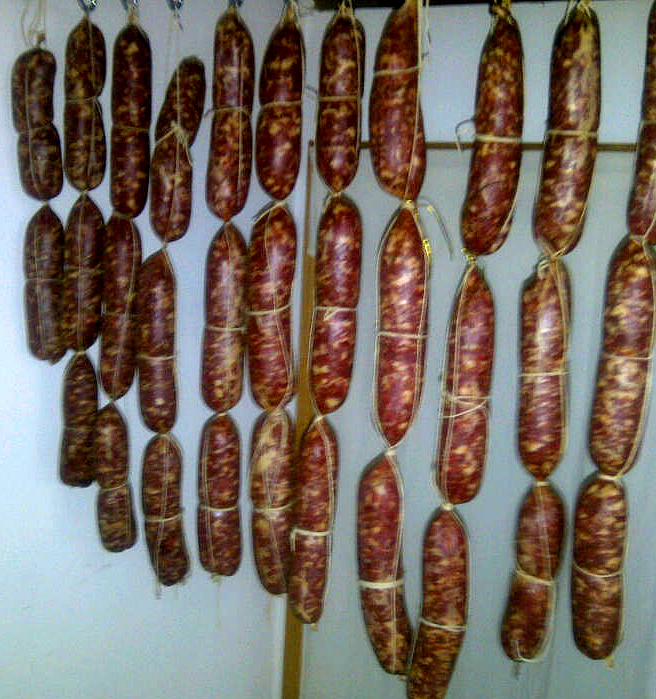 Sopressata Salami (also called Supersata) is a traditional Italian cured meat product. It is usually a flattened shape, up to a foot wide, and can be several feet long. It can also be round, but the name refers to the widespread custom of pressing it with a heavy weight during the curing. It is a popular salami, but not to everyone's taste. It is usually produced in the autumn when the family's hog is butchered. That's the fancy version. The original version made use of all the cuts that were left over for the butcher's family after the good stuff had been sold. At its most basic, it used all the bits and pieces that were available to a thrifty and hungry family; it was thought of as "poor man's salami." Most sopressata is made entirely with pork, but it's not uncommon to use a small portion of beef to fill out the ingredients. When I think of salumi, I always think of sopressata first. I have great memories of eating it even before I knew of prosiutto. Sopressata was always cheaper and it plays an important part in the Easter Eve celebration for my family. One of the traditional dishes served on Holy Saturday is a spaghetti pie made of cooked pasta, ricotta, eggs, and black pepper. 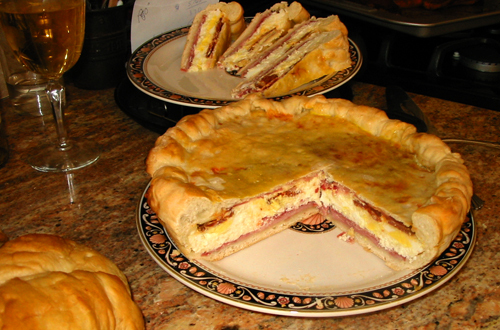 It's baked in a roasting pan and served a room temprature with slices of soppressata. I can picture my brother and me as kids using our teeth to separate the sopressata casing from the meat and chewing the garlicky, peppery meat with wedges of spaghetti pie. So when it came to choosing a dry sausage to make at home, I immediately thought of sopressata. Last night I attended a home made wine and Sopressata competition and dinner in Niagara Falls(see post in WLDG). There were many varieties of Sopressata, but were simply divided into hot or mild categories. I did manage to find 2 Sopressata recipes on the internet, but was wondering if anybody here had other recipes, comments or recommendations.